Learning the skills to communicate well is not difficult, and is easily accessible to all of us. In fact, it’s relatively easy to acquire in light of the potential and power it can provide you. But with good communication well within reach and so critically important, why in the world are so many of us still so bad at communicating effectively?! That’s the question communications expert David Grossman set out to find, and along the way he came to some surprising conclusions. Above all, David discovered that there really aren’t any reasons people communicate badly. 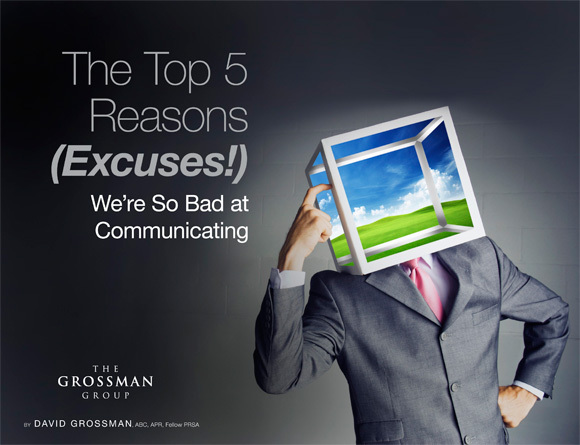 No, the real causes of ineffective or weak communication are excuses. In other words, the only things holding people back from great communication are ourselves and our perceptions. Download The Top 5 Reasons (Excuses!) We’re So Bad at Communicating and put bad communication behind you!